You are Here:Home/INTERMODALISM: NPA FLAGS OFF SOLID MINERALS EXPORT. 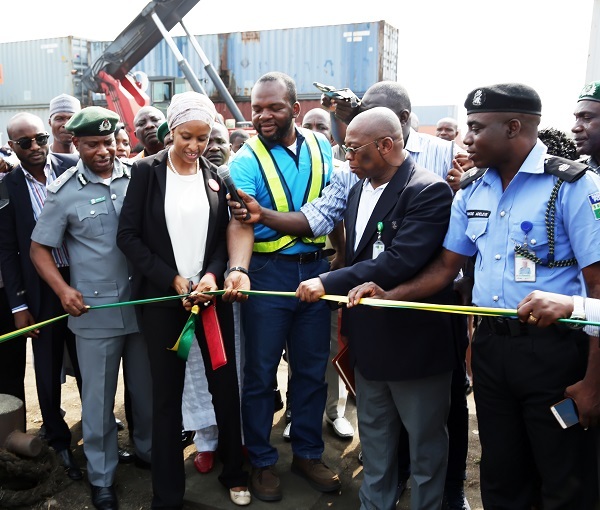 The Managing Director of the Nigerian Ports Authority Hadiza Bala Usman has flagged off the first export consignment of manganese, a solid mineral resource from the Ikorodu lighter Terminal even as management is keen in provisional intermodalism as part of efforts to further decongest the Apapa Port axis. Speaking at the event the Managing Director said that “NPA is ready to partner with any agency or company which will give a pride of place to intermodal transport as the continuous reliance on our road is no longer feasible and should be discouraged’’. 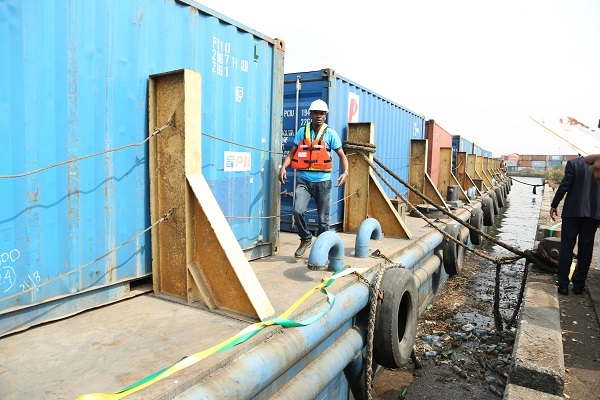 Usman added that this event is of huge economic advantage to the country and that using barges to ferry containers of solid mineral across the waters to the APM Terminal within Apapa Ports will help to elongate the life of our roads as this mode of export will be most encouraged. Furthermore the Managing Director stated that the occasion is an eye opener and also serves to generate more revenue for the nation and provide employment opportunities. 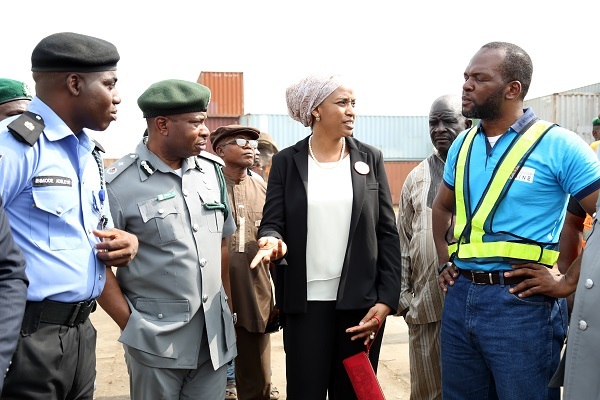 Calling on stakeholders to key into the window of Public Private Partnership (PPP), she stated that the occassion further deepens NPA Management efforts at complying with the federal government’s directives on the Ease of Doing Business at the nation’s Sea Ports whilst the rehabilitation of the Ports access roads are ongoing at Apapa. In partnering with and encouraging private initiatives, the MD NPA added that Management would ensure the deployment of Standard Operational Procedures (SOPs) with the view to complying with international best practices. 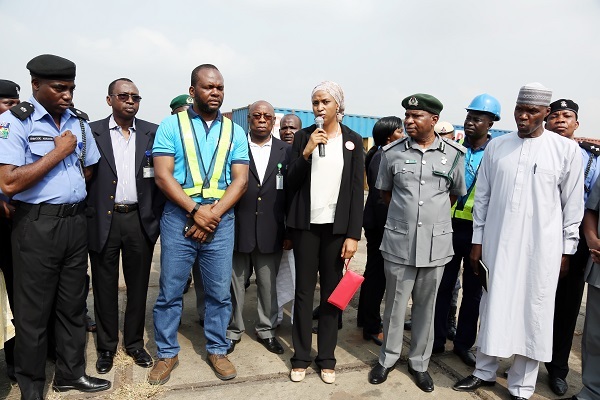 The Chief Executive Officer of Connect Rail Services Limited (CRSL) Edeme Kelikume representing the service provider appreciated the NPA’s role in the provision of the enabling environment for the take-off of the project. It would be recalled that from inception the present NPA Management made bold that it would promote the stimulation of export trade through the nation’s sea ports.